In what's known as Ireland's "sunny southeast," County Wexford is a hotspot for Dubliners wishing to escape the city and spend time on the many beaches dotting the coastline. Indeed, despite a lengthy drive of almost two hours to the capital, some choose to live here and commute daily. With its close proximity to Rosslare ferry port (about 20 minutes by car) as well as Europe and Britain, Wexford gets its fair share of visitors from overseas. Wexford town is small and as such, many attractions lie in the surrounding countryside and along the coastline. Hook Lighthouse, just under 40 minutes from Wexford town, is one of the oldest lighthouses in the world that is still in use. The present structure has graced these shores for more than 800 years and is regularly voted one of the top attractions in Wexford. Besides the tower itself, there's a visitor center, a café, and a gift shop, and guided tours are available year-round. Visitors can climb the 115 steps to the balcony for beautiful views. 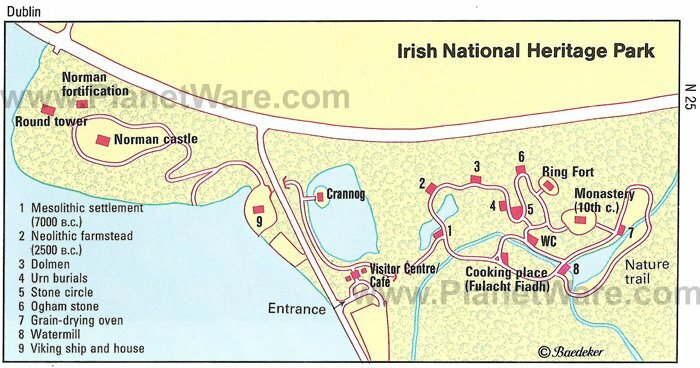 Near Ferrycarrig, about five kilometers northwest of Wexford town along the N11 road to Dublin, is the Irish National Heritage Park encompassing 35 acres of woodland, wetland, uplands, and estuaries. This open-air museum has to-scale replicas of places and buildings illustrative of some 9,000 years of Irish history (dolmens, a ring fort, early Christian monasteries). Sightseers can take a tour with a guide in period costume or stroll around in their own time. Children's activities include panning for gold, 'wattling' a house, and creating rock art. Leaving Wexford on the Rosslare road (N25), a signpost on the right leads to Johnstown Castle. This neo-Gothic structure incorporating the remains of a Norman fortress is not open to the public. The park, however, with artistically situated ponds and more than 200 different flowers and shrubs is extremely beautiful. The gardens were designed by Daniel Robertson who is famed for the magnificent gardens at Powerscourt House in Co. Wicklow. Getting there by car takes about 11 minutes from Wexford town. Berthed at New Ross Quay, half an hour's drive inland on the N25, the Dunbrody Famine Ship should be high on any visitor's agenda and is one of the foremost attractions in this part of Ireland. The ship is a reproduction of an 1840's emigrant vessel and there are guided tours, themed exhibitions, and performers in costume all designed to instil appreciation of the hardship suffered by those forced to emigrate during the mid 1880s. A visitor center with a café houses the Irish American Hall of Fame. The Westgate, northwest of Wexford town center, is just one of five town gates still remaining. Founded in the 12th century, the ruins of St. Selskar Abbey are nearby. The Abbey boasts an impressive history. Here, the first of many Anglo-Irish treaties was signed, and in 1172, Henry II did penance here during Lent for ordering the beheading of Thomas Becket. Surviving are a battlement tower and the remains of St. Selskar's Church, a National Monument. The abbey was left in ruins by Cromwell's troops in 1649 during the notorious massacre and pillaging that took place. The Protestant church that stands here today dates from 1818. A ten-minute drive from New Ross brings visitors to the Kennedy Homestead, the ancestral home of the Kennedy family where John F. Kennedy visited in 1963. This is the birthplace of Patrick Kennedy, John F. Kennedy's great-grandfather, and an interpretative exhibition explores Patrick's possible reasons for leaving Ireland and his journey to America in 1848. There's also a timeline of the Kennedy's progress in the USA through subsequent generations. Recently, the site has been upgraded, and members of the US Kennedy family were in attendance when it was re-opened. Around 30-minutes' southerly drive from Wexford town brings you to Kilmore Quay, a remote and picturesque fishing village. An old lightship moored at the quay houses a maritime museum. From here, you can take a boat to the rocky uninhabited Saltee Islands (Little Saltee and Great Saltee). The islands are very popular with day-trippers and birders, although they are privately owned. Permission for day visits to Great Saltee isn't needed, however visitors can't dock at Little Saltee due to the hazardous landing conditions. These unspoilt outcrops are Ireland's largest bird reserve, the nesting place of some 30 species, including cormorants, puffins, razorbills, and fulmars. In High Street, stands the 18th-century Opera House, where the Wexford Opera Festival is held annually at the end of October. This three-week festival includes opera, theater, classical concerts, and fringe events that take place at various times of the day and late into the night. To the left, along Henrietta Street, is Crescent Quay, a semi-circular square on which stands a statue of Commodore John Barry (1745-1803), erected by the United States Government in honor of the father of the American Navy.